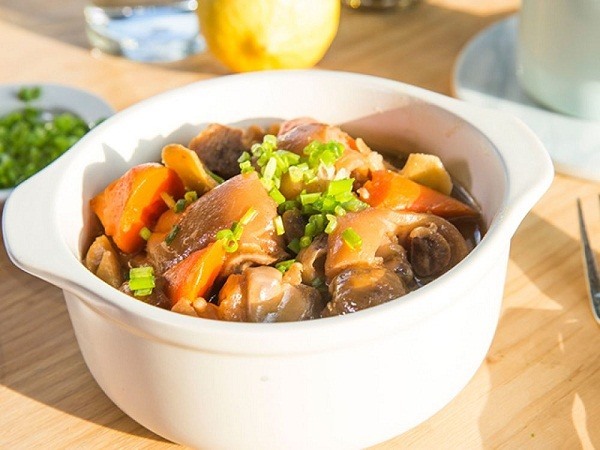 Yummy: Chestnuts stewed with pork leg is often prepared to welcome visitors. Trùng Khánh chestnuts are one of the nation’s tastiest and meatiest fruits. They have won a following among locals and foreigners. The trees have existed in Trùng Khánh District, about 62km from Cao Bằng City, for thousands of years, said 98-year-old Tạ Văn Nậm. Nậm said his ancestors had grown the trees and the job had been handed down through the generations. “Thanks to the cool climate and favourable land, Trùng Khánh chestnuts are well known far and wide,” Nậm said, noting that apart from boiling and frying them, Cao Bằng housewives used them as the main ingredient to cook many dishes, such as chestnut stewed with pork leg, chestnut pudding, chestnut porridge and particularly chestnut mixed with cốm (young sticky rice) made from Pì Pất sticky rice - a special rice planted by Tày ethnic people, which is very soft and fragrant. Nậm’s wife Nông Thị Thắm cooks the food well. She said she had to wake up early in the morning to go to the market to buy a fresh pork leg about 1.5kg. The pork leg must be burned over fire to clear all the hairs, then cut into pieces and soaked with spices such as fish sauce, pepper, a little sugar and chili for two hours, before being stewed with carrots and chestnuts. 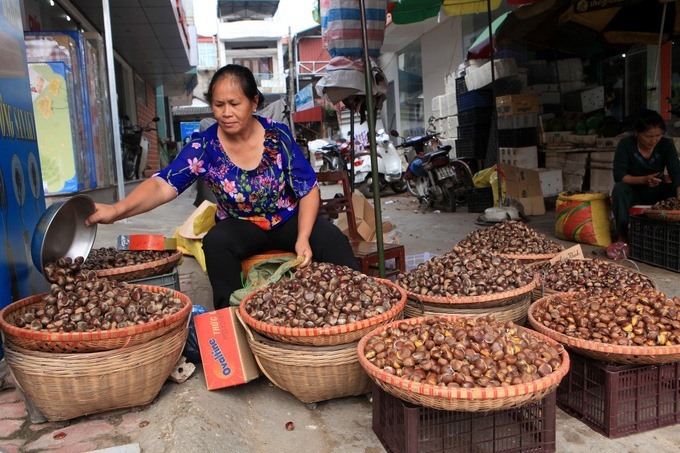 Fruitful: Trùng Khánh chestnuts are available in Cao Bằng market this lunar month. The chestnuts should be boiled for half an hour then taken off their covers and cut into two parts, said Thắm. “I have to stew the food over light fire for an hour until the fragrance is flying out. The dish should be eaten hot when it is more tasty and delicious,” said Thắm. She said the dish was often cooked to welcome guests and for big parties, such as a death anniversary and for Tết holiday. “I often cook the dish as a gift to my two children’s in-law families in Hà Nội during the chestnut seasons in the ninth and tenth lunar months. They said they like the food so much,” said Thắm. Different from young sticky rice in famous Vòng Village in Hà Nội, the cốm in Cao Bằng is made from a special sticky rice named Pì Pất, which agriculturists say is high quality compared with other sticky rice grown in the north. Thắm said the cốm is ground in a wooden mortar shaped like a boat by young Tày couples, who often sing Tày ethnic songs called sli while doing the work. “Our villagers, particularly children are very cheerful running around the mortar, laughing and talking loudly. Our entire village enjoys the cốm fragrance,” said Thắm. She said the cốm mixed with chestnut powder will make an unforgettable dish. 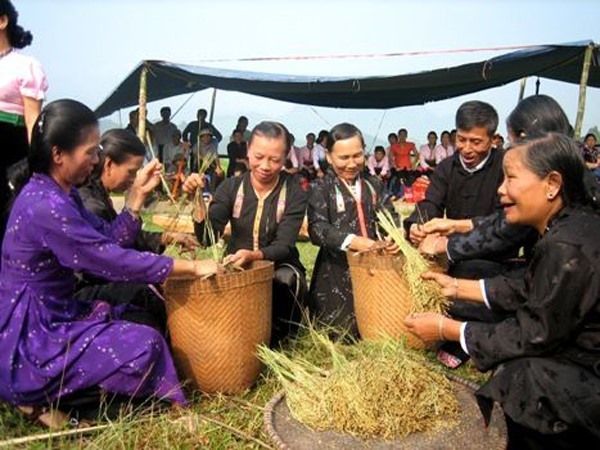 Through the grind: Tày people in Cao Bằng make cốm (young sticky rice). Nguyễn Văn Hiến and his wife Phạm Thị Thuần, who recently visited Trùng Khánh, said they heard about the food but tasting it on the spot was beyond imagination. “We enjoyed the dish so much. It is the quintescence of Cao Bằng itself and our country as well,” said Hiến. He said he met a group of Danish visitors who agreed that the Trùng Khánh chestnut was bigger and much more fragrant compared with other chestnuts. “ It should be exported to the world,” he said. 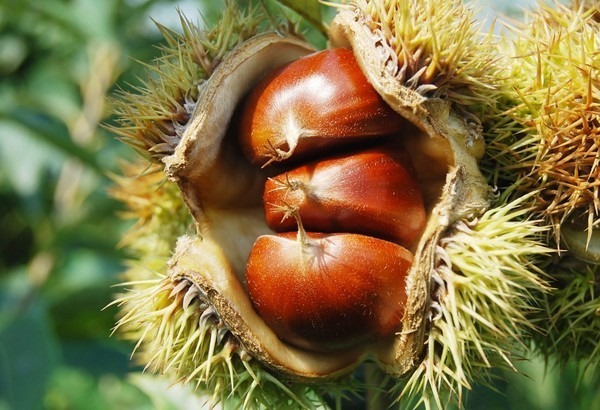 Herbalist Nguyễn Văn Vinh from the National Hospital of Traditional Medicine said chestnuts were good for human health. They are rich in cellulose, carbondydrates, vitamins, minerals and kali. Vinh said cellulose helped to stabilise glucose, reduce cholesterol and constipation. He warned however that those with stomachache should not eat many chestnuts because it produced acid in the stomach, causing indigestion. Rich kali in the nuts helped stabilise cardiovascular system and hypertension, while vitamins helped improve brain function and prevent breast cancer, said Vinh. “Chestnut porridge is very good for pregnant and women who have recently given birth." he said.